Creative Science Education in the 21st century requires Knowledge Imagination, Direction….and Play. Helping children and teachers to make creative connections is our passion! In a time of information overload, it’s the connections that our children make which will create great thinkers. After 18 years, as one of the original science outreach companies serving over 2000 schools and institutions, we know the power of creativity and fun in education. 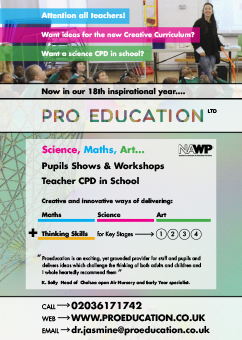 As highly qualified educators, unique in the breadth of our experience, we have developed simple and innovative ways of delivering science, art and maths Inset to teachers and shows and workshops to pupils, of all ages. This is especially important now as recent changes in the National Curriculm following the report ‘Lifting the Lid on the Creative Curriculum’, have re-introduced ‘open questions’ in science education. This requires the type of cross-fertilization of ideas inherent in our both our approaches and our individual practices..
We pride ourselves on being more educators than entertainers. We want you to feel inspired long after we leave. We do have a standard set of topics we offer, but if your school wants new ideas, cross-curricular connections and practical hands-on ways of meeting National Curriculum guidelines we can help. Apart from all the lovely kids we have come into contact with over the years, we have worked with bodies such as The Royal Society of Chemistry, The Science Museum and The Institute of Education to name but a few. Why not give us a call and see what we can do for you. Great thinkers can be created. I have had nothing but postive feedback from staff after our inset. You pitched it perfectly.